The Media Composer just keeps getting more flexible and powerful. But with all this flexibility comes complexity. And good as Avid is at making the machine do whatever we might desire, it often fails when the time comes to explain those capabilities. Without the explanation, the power isn’t worth all that much. I’m starting new show with Adrenaline machines, using the latest software, Quad-core G5s and Unity. First impressions — very fast. Probably the most responsive Avid I’ve ever used. And a far cry from the early, and very buggy, Adrenaline machines I’ve used in the past. Then there are the “Film and 24P” settings. I can guess what they mean, but it sure would be useful to actually know what they mean. The help system tells us little more than to select the settings you want. Defaults and settings have been a bugaboo of the Media Composer since the early days. They’ve been responsible for a lot of problems. If you set up your project incorrectly you pay for it later. Avid needs to add some explanatory text to these settings panes — text that is vetted by real editors to make sure it conveys the meaning intended. A little money invested here might save a lot of money on customer support. This entry was posted on August 22, 2007 at 6:34 am and is filed under Avid Technical Tips. You can subscribe via RSS 2.0 feed to this post's comments. You can skip to the end and leave a response. Pinging is currently not allowed. I recently experienced a similar thing with Xpress Pro(i think 5.7.x.). I was 1,000 miles from home base and waiting on footage to arrive. Luckily I hadn’t anything important to do for a few days other than assemle some temporary elements while we waiting to shoot new footage. I was trying to add some footage to my current OMFI folder from an older job I worked on but no media files were listed. I cursed myself for a moment while I thought I had for some reason captured locally. I soon realized the real problem lied within a small setting. Xpress was set to capture MXF by default, and after a few tries figured out there were two settings I needed to change to get both video and audio in OMF media mode to get everything back to my trusty OMFI folder. A small transcode and I was ready to roll again. Aha!! 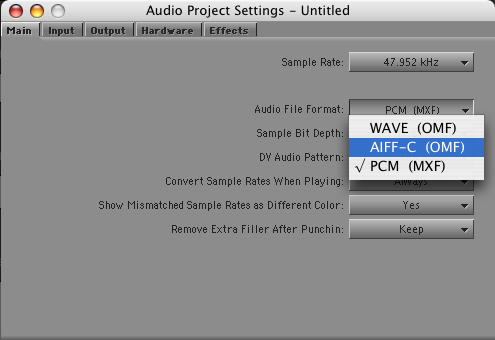 So THATS why when I import an AIFF it brings it in as MXF! Genius, thanks for the tip. And I thought I knew my way around an Avid. I’m on a PC Adrenaline right now and can’t recall if its the same on the Mac Avid, but you can right click on just about anything in the interface and get a “What’s This?” option which will take you directly to the relevant page in the system manual. Any setting you don’t understand, just right click and you get the full explanation. Very cool feature.